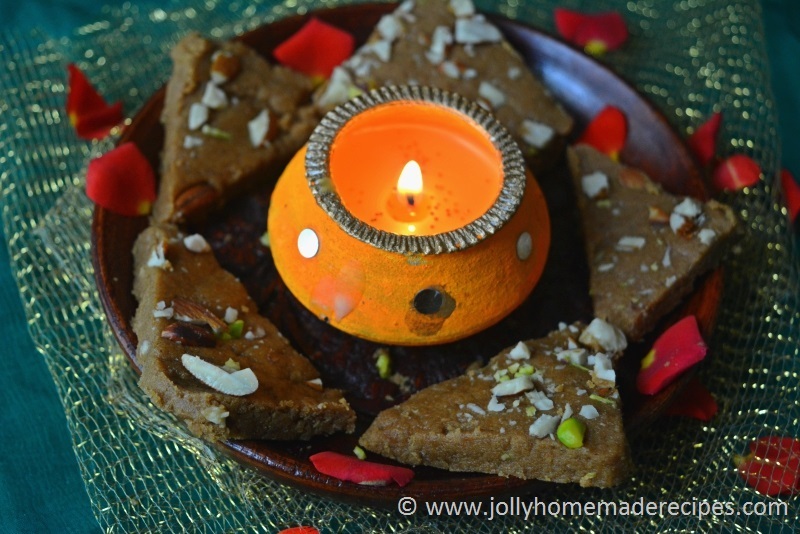 Gur Papdi Recipe with step by step photos - A traditional rich Indian desert made from whole wheat flour(atta), jaggery(gud), desi ghee(clarified butter) and some crunchy nuts(dry fruits). 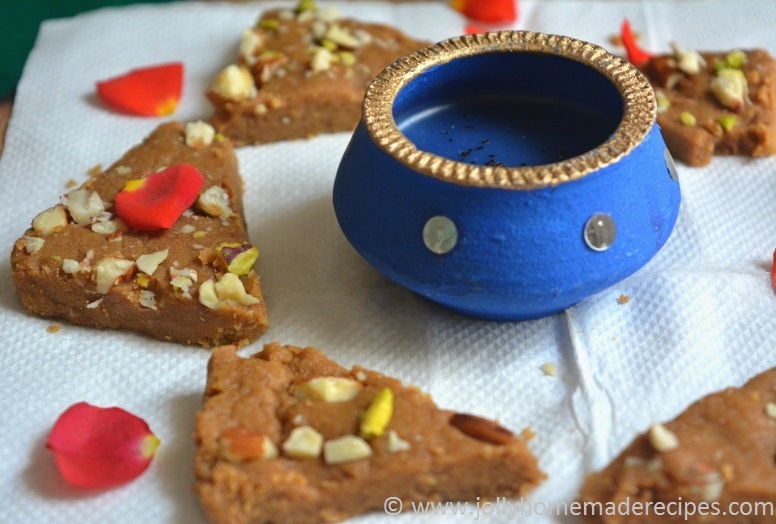 This is very popular sweet-dish from Gujarat. It is also known as Sukhdi, Golpapdi or Gudpapdi. The appearance is satisfying and flavors too are rich, soft, crumbly and melt in your mouth. 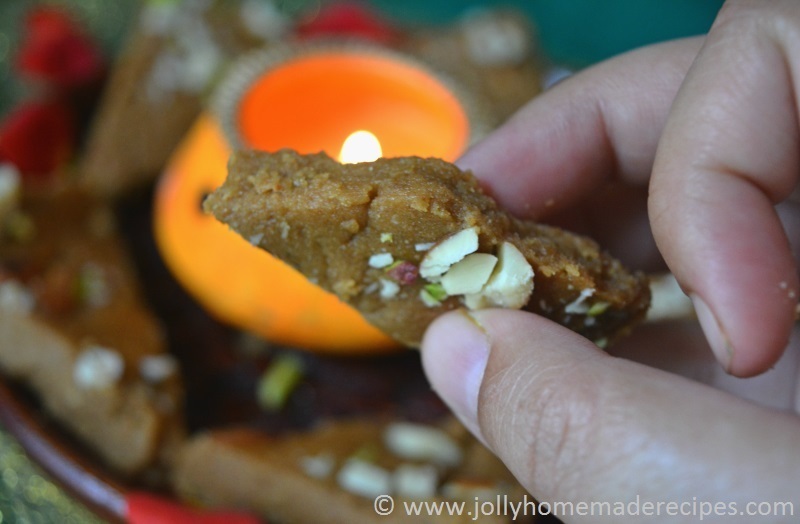 As Diwali is nearing, you can include this easy peasy sweet recipe in your festive menu. With just 3 ingredients, it tastes awesome! It can be done under 15 minutes. 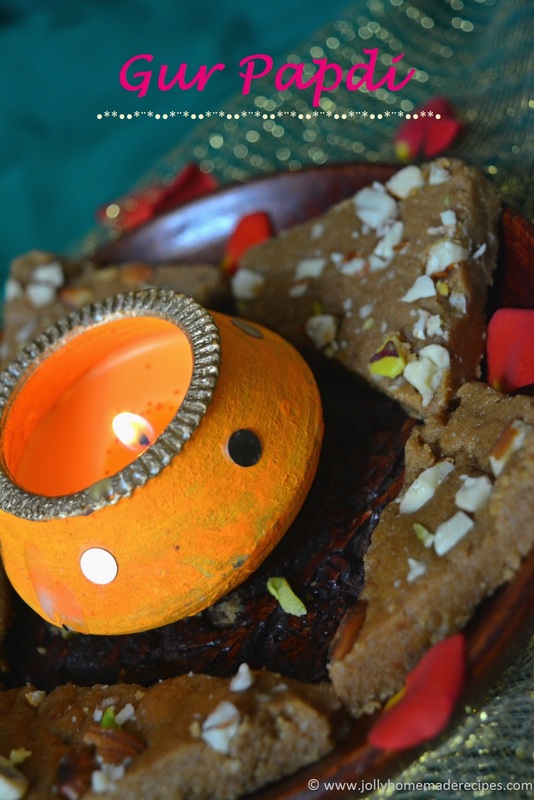 bhai dooj or any religious ceremony conducted in our home or simply make them for any celebrations and enjoy them. This is one of the most favorite sweet at my home. It is very healthy and easy to make. Gur Papdi can stay for long enough,we can carry them while travelling also. In the below picture you can see how perfect and melt in mouth the gur papdi have come out. Although sweets will be easily available in your nearby sweet shop but the one’s you make yourself at home taste even sweeter. Be soft and gentle with them and they will be softer and more tasty !!! 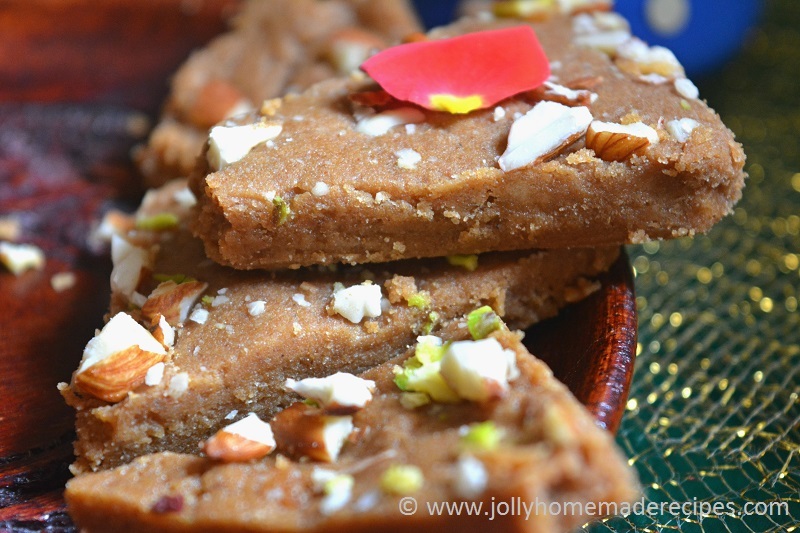 There are many variations of making gur papdi, I am sharing one of my favorite recipe, if you don't like nuts so you avoid it or if you don't like cardamom powder in your sweet dish, avoid them too !! 1. First prepare the tray or thali to set the gur papdi. Grease the plate well using with ghee. 2. Heat ghee in a heavy bottomed pan or kadai. Add sieved wheat flour to it and roast it on a medium flame. 3. Stir constantly for 4 to 5 minutes or till the atta/flour change the light brown in color or also you get nice aroma in your kitchen. Switch off the flame. 4. Allow this to cool slightly. 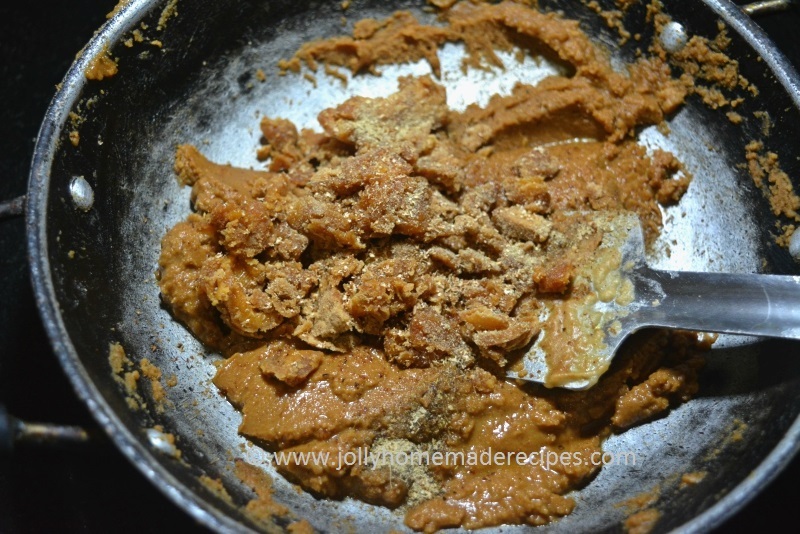 When it is lukewarm, add grated jaggery and mix well until combined. 5. Add cardamom powder and nutmeg powder and mix well. 6. Transfer this mixture into a greased tray. Sprinkle diced nuts onto it, press and level it using the back of a spoon. 7. Cut into diamond or your choice of shapes. Allow it to cool completely before transferring on to a serving tray or an airtight container. 8. Serve it warm to your family or let it completely cool down store it in air tight container and then serve as required. * Gur papdi always taste best when its warm. You can store this for 15-20 days easily at room temperature. * To make sure the gur papdi doesn't get chewy, always switch off the stove and then add jaggery. * Always make sure you grate the jaggery it will prevent from any lumps formation. * When it's warm cut it into desired shape (square /diamond). good effort Jolly.. Looks delicious.. 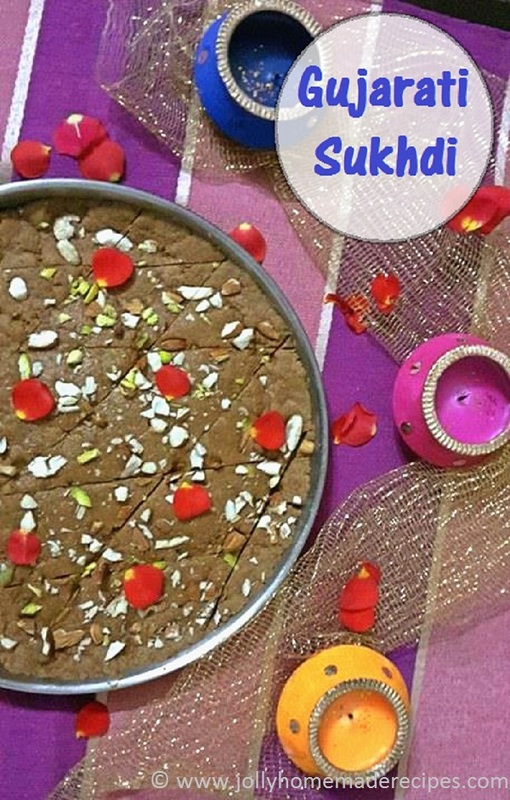 Happy Diwali to you..
Looks very festive and super delicious, love this gur papdi very much. Happy diwali dear. This sounds super delicious! One classic sweet of Gujarat. Excellent, well made dear. 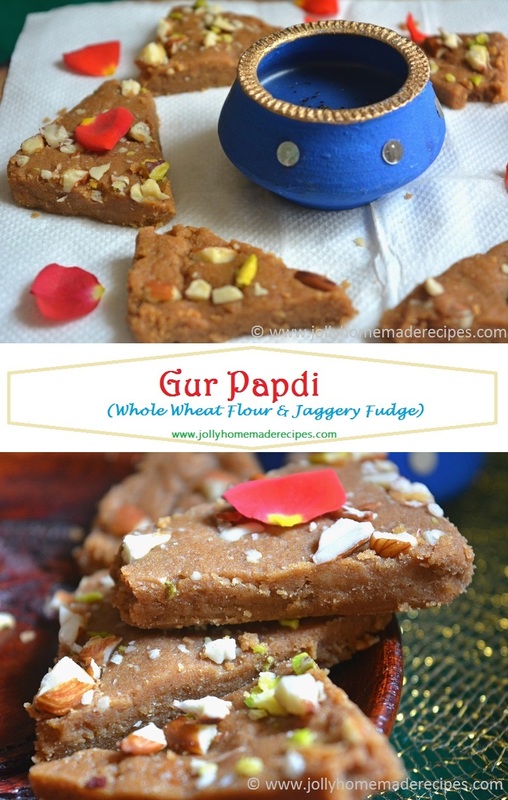 jolly, my mouth was watering while I was reading about gur papdi. 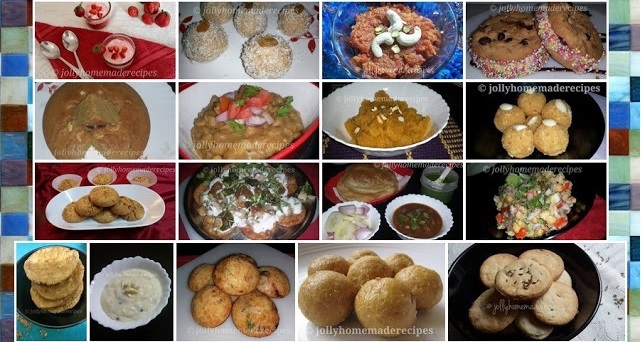 I usually make it for Uttaran in Jan. Also home made sweets are definitely the best. Wow! Looks super yummmy!! Lovely clicks!! yummy sweet. 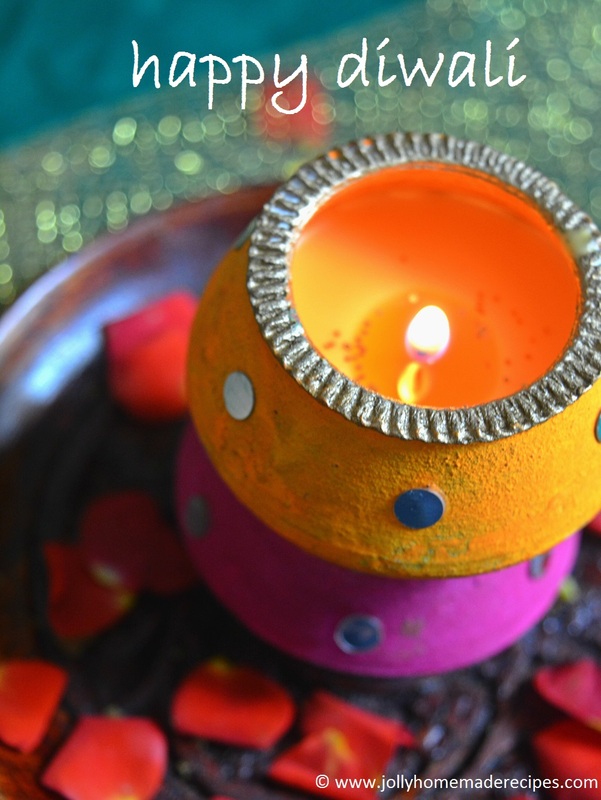 hope you had great diwali. With simple ingredients you made nice and tempting sweet.I can imagine the taste.